Our friendly and competent staff is dedicated to patient comfort and quality care. We provide the best and latest in dental technology and treatment options. We provide gentle, family-oriented dental care to the adults and children of this community. The source of water for our dental units is distilled water (bottled water) which removes any chance of contamination from regular tap. Items that may not be cleaned using the above methods are disposed after each patient, including gloves, suction tips, needles, etc. 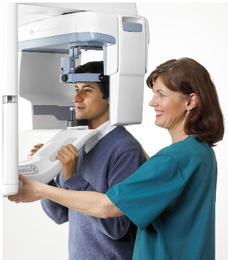 At Powassan Dental Centre, we offer the most advanced technology. Not only do x-rays taken with digital technology use less radiation, but eliminates the need to dispose of toxic lead and developer chemicals! The information is transferred to our computers almost instantaneously and you can see your own teeth zoomed to any magnification. Our digital panoramic machine (pictured here) uses advanced technology to optimize the diagnostic of every radiograph and is frequently used to assess adolescent oral development, wisdom tooth concerns, or just for people who have difficulty biting onto the traditional intraoral x-rays. 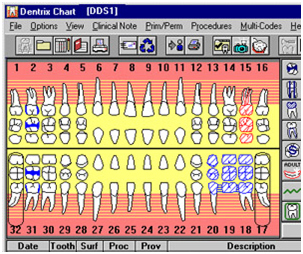 The Scan X digital x-ray system as shown above, is used for routine checkups to look for cavities and to assess periodontal health. Even though it is digital, it is much thinner and less bulky than the wired digital sensors found in some dental offices. Why should you care about computerized records? All of your information is stored electronically, and protected with various backup schemes so you can be sure that it will not be lost under any circumstances. To provide the highest level of integrity, it is not possible to alter or delete your clinical chart after it has been entered into our system. We can quickly retrieve your records at any time, and reproduce them in a highly legible format. Computerized charting also allows us to send claims electronically to all participating insurance companies, which results in faster reimbursement and instant notification of billing discrepancies.